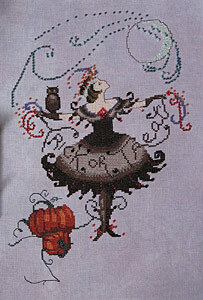 Lara's Loose Threads: Halloween Fairy is almost done! I took this photo earlier in the day yesterday while the light was still good (Tropical Storm Hermine was approaching with lots of clouds), so I've actually gotten even closer to finishing than when I took this photo. Apologies for the weird shadow on the left side.